26-Nov-2014 -- Today I took a break from sightseeing in the Perth area to visit two easy-looking, though remote, Degree Confluence Points to the North-east. From Perth, I drove eastward across the Perth Hills, and entered the vast, flat ‘Central Wheatbelt’ region of Western Australia. I drove through the small farm town of Northam, and the even smaller farm town of Goomalling, before turning onto dirt roads. Eventually, I ended up on Uberin Road, which passed 500 metres to the west of the confluence point. Satellite imagery had shown the confluence point to be on what appeared a dirt road, and I had originally hoped to drive to the point - but I discovered that the ‘dirt road’ is really just a farm path, along a fenceline. Instead, I parked on Uberin Road, and did an easy 500 m each-way hike to the point. It was hot (mid 30s °C) and windy as I walked to/from the point. And I was besieged by flies throughout - but I've come to the conclusion that flies are ubiquitous throughout Western Australia, so I'm probably not going to mention flies again when I report on future confluence point visits in WA. 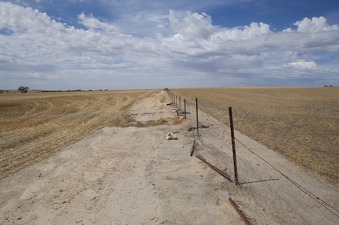 The confluence point lies on a north-south fenceline - presumably surveyed to follow the 117 degree West line of longitude.